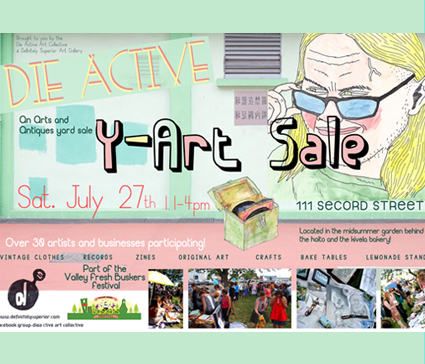 The 4th annual Die Active Y-Art Sale is back! An Arts and Antiques Yard Sale, in association with the Valley Fresh Buskers Festival. Discover the works of young local artists, clothing designers, crafters and Die Active members for sale. Shop for zines, buttons, records, handmade jewellery & clothing, vintage treasures and more! Featured Vendors: Die Active, The Craft Collective, Kivela Bakery, the Hoito, Infinity Designs and the Buskers Festival performers & vendors! Fabulous Dave with his DJ ambiance for your pleasure. A unique event with live performance and one of a kind art for sale; all proceeds go to artists, 300+ attended last year.